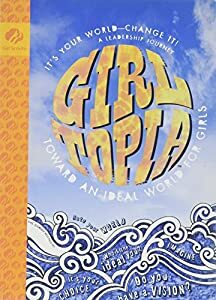 GIRLtopia. Girl Scout Seniors know the world is not ideal. This journey for ninth-and-tenth graders is their chance to imagine a perfect world-for girls. They’re invited to create their vision as an art project-in any medium of their choice. Then they’ll take action to make their vision a reality. Leaders, after all, are visionaries! The girls identified a true need in the community after reading about The Time of the Month Club. They then baked and sold brownies and used their coupon clipping skills to shop at Target to but over $140 of feminine hygiene products to donate to Friedens Community Ministries Food Pantry, at the Hope House location. They then handed them out to their clients. They hope you’ll read about the Time of the Month Club’s mission and spread awareness of this need.